For a long time I have been sensitive to Kate’s behavior when we are eating out. Up until last night, she hadn’t done anything that was likely to be noticed by anyone who was not actually sitting at the table with her. The thing that has bothered me most is that she often arrives at a restaurant looking as though she is tired. Getting out of the car and walking into the restaurant she often looks sad and tired. When she is seated, she often sits there with her eyes closed as though she were going to sleep or is asleep. This behavior doesn’t bother or disturb anyone but me. I tend to feel self-conscious. I wonder if the servers and people around us might think the two of us have had a serious quarrel. The other thing that has bothered me is her use (consumption) of paper napkins to soak up her saliva. Fortunately, several of the restaurants we patronize give us an extra supply with our meal, sometimes before. Often, we have only a cocktail napkin under each of our drinks. She goes through hers rather quickly and then often asks for mine. That is consumed quickly as well. Along with the salivation, she sometimes burps. It is not very loud but loud enough to be heard at an adjoining booth or nearby table. Last night, she did something new. Kate had ordered a pasta entrée, and the server brought her a small dish of Parmesan cheese before our meals arrived. I noticed that Kate took several spoonsful and ate them. When her pasta arrived, she dumped the remaining cheese on top of the pasta. The latter is not unusual. She typically puts the entire dish of cheese on her pasta. This afternoon she has been outside working in the yard. Most of the time she works in the front flower beds pulling leaves. Today she has been out back. At one point, I went out and noticed that she had cut one of the hydrangeas to the ground. I commented on it. She asked if that were all right. I told her it was fine. I just wondered if she remembered that they will die back for the winter and grow back next spring. I also said they would live nicely for another 2-3 months. I just looked outside. It looks like she cut down two plants and left one. Yesterday she came in the backdoor and called me. I saw that she had brought a man with her. He told me that he does yard work for some of our neighbors. Then he took me outside and showed me the numerous shrubs whose leaves Kate has pulled off and have not grown back or not grown back fully. He told me they needed to be taken out and that he would do it. I told him I had plans and that I was not going to take them out right now. Kate was with us or I would have fully explained why I didn’t want him to do anything. My plan is to wait until Kate is in a later stage of her illness and to have all of them taken out, the flower beds cleaned out, and have a landscaper put in something new. Kate and I are seated at a table at Barnes & Noble where I have been checking email. She is working jigsaw puzzles on her iPad. It is rather peaceful here. That is an improvement over this morning when we were at Panera. That has nothing to do with the place but with Kate’s problems working her puzzles this morning. She must have stopped a dozen times because she kept hitting a button that took her out of her puzzle. Each time she would close up the cover on her iPad and put it down on the table. She never once asked for my help. Each time, I reached over to pick up the iPad and get her back to her puzzle. She was very discouraged. In fact, I thought that she would give up and want to go back home. That never happened. Finally, it was getting close to 11:20; so I suggested we go to an early lunch. She accepted. As we walked out, she walked very slowly. Her facial expression looked as though she were struggling to make herself walk. She didn’t speak on the way to lunch, nor during lunch. I didn’t speak much myself. I just let her relax. As she so often does when we are out to eat, she closed her eyes and appeared to be going to sleep as we sat there waiting for our food. She pulled leaves for a while after getting back home. It didn’t last long. She came inside and worked on her iPad in the family room, something that doesn’t often occur. I was finishing up a letter to a doctor at Kate’s family practice. He is actually the one who started the practice. I have been trying to contact her doctor since June 26 without success. Something strange is going on. I decided to write the senior doctor to ask his help. I first knew him as a neighbor. Later we had contact in connection with my service on the hospital’s foundation board. I have to believe I will hear something by early next week. He won’t get the letter until tomorrow or Friday. My concern is Kate’s salivation problem. Kate still is not swallowing her saliva. Even as I said this, it dawned on me that I have not seen her spitting out any saliva while we have been here. That is a good sign. It may indicate that she only spits it out when she thinks about the saliva. Today I took another step in the process of securing in-home care for Kate. At the moment, all we need is for someone to be here with her when I have to be gone. In particular, I have become uncomfortable leaving her in the early morning so that I can get to the Y. I plan to change my pattern and go in the afternoon. The plan calls for us to have someone here Monday from Noon to 4:00 and on Wednesday and Friday from 1:00 to 5:00. With the changes that Kate is making I feel like making these preparations is appropriate. At the same time, I am becoming uneasy about breaking the news to her. Many times I have felt that the anticipation of problems is often greater than the actuality. I hope this will be the case. We are supposed to start next Wednesday. Our son will be here on Saturday, September 9. For that reason the following Monday and Wednesday, I have asked that they agency not send anyone. Earlier this afternoon I posted a journal entry about little changes in Kate’s behavior that are becoming commonplace. This afternoon she exhibited another one. It is not the first time this has happened, but I don’t recall saying anything about it. Kate came in from outside where she had been pulling leaves. She was hot and sweaty. Naturally, she wanted to take a shower. Typically, she just goes to one of the bathrooms. She chooses the guest room bath most often. Today, she looked at me and asked which one I wanted her to use. I told her could have her pick. She started to walk away. Then she turned around and asked, “Did you say the middle one?” I said, “That would be fine.” This fits the increasing pattern of asking for my advice or permission. Among the changes in Kate’s recent behavior, I have noticed changes in her mood. I had previously mentioned that she had had several days during which she was in an especially good mood and very cooperative. She seemed to accept just about any of my suggestions. Then she had a day when she was quite irritable. That didn’t last long, and we returned to our usual habits of a mixture of more neutral behavior with a few irritable moments when I make suggestions about things to wear or offer my hand when she is going up or down stairs or a curb. We had a good day in Asheville on Sunday. Then yesterday morning she was irritable without any precipitating action on my part. We had a lunch scheduled with several people from our bank. She was far from excited about that. She seemed to enjoy herself and chimed in several times to make fun of my talkativeness. This is something I didn’t mind at all. It was fun to see, and I think our friends at the bank felt the same way. It was, however, something she would not have done before her Alzheimer’s. It was one of those times that her brother refers to as speaking with his “filter turned off.” I’ve learned that he means that he is insensitive to the possible impropriety of his comments. This morning as she was getting out of bed she asked me if she should make up the bed. I don’t ever recall her asking this before. The only thing I can relate it to is that she knows our housekeeper comes once a week and washes the sheets. On those days, she did not make up the bed. Over the past 2-3 years, she hasn’t regularly made up the bed on any day. This is worthy of comment although I don’t believe I have mentioned it before. Her mother had taught her to always make up the bed. 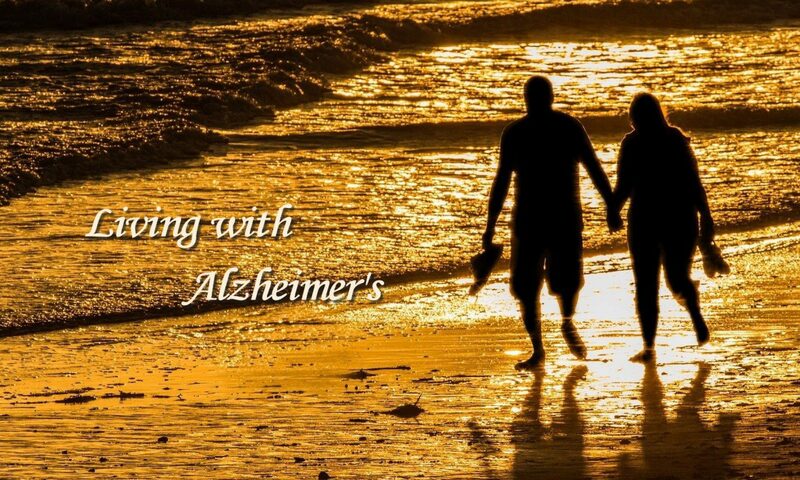 She has done so throughout our marriage until Alzheimer’s. Another connection to asking me this question is that asking my advice, permission, or confirmation is becoming another of those little changes that are taking place. This one just surprised me. When we returned from Panera this morning, she asked me if she should wear a cap when she went outside to pull leaves. This was the first time she has asked this. It is an overcast day. Perhaps, she was really asking herself if she needed a cap. When we got home from lunch, she asked me if she could use the clippers while she was working outside. As always, I told her she could. We drove to Asheville for lunch, a play, and dinner. We had a nice lunch and Jenny, who works the front desk, gave us an upgrade on our room. A few minutes ago we got back from the play. Before the show began, I got Kate a bottle of water that she took with her into the theater. At intermission, the man in front of her said something to her about squeezing the bottle and making noise during the first act. She said she didn’t squeeze it. He said, rather sternly, “Yes, you did.” She said she was sorry. A few minutes before the second act began I leaned down to him and told him that she has Alzheimer’s and that it was my fault that she had made the noise and that I just didn’t hear it (which was true). At the end of the performance, Kate tapped him on the shoulder and said something about her mother’s having gone to TCU. Then she asked me what her mother’s maiden name was. It was a good thing I had told the man about her diagnosis. He smiled and asked her if she enjoyed the performance. She told him she had. Then we moved on. Kate’s requesting permission to work in the yard and specific places in the yard is becoming a regular pattern. It also extends to things like asking if she should take or leave the glass with her iced tea at the restaurant as she did tonight or take it with her. It has been a while, but on two different occasions, she has started to walk away with her glass from our favorite Mexican restaurant. One time the owner caught her and asked if she would like to have a take away glass. The other time I caught her before anyone noticed. She also continues to make requests without verbalizing them. For example, with her glass of tea tonight, she just lifted it up and brought it to her chest with her face making the gesture of a question. Yesterday for the first time, she did this with someone else. She walked into the examination room with me at my ophthalmologist’s. She held up her iPad and gestured to the assistant who brought us to the room. The assistant didn’t know what she was asking. I told her. This morning at Panera, Kate and I met with the social worker from the agency that is going to provide in-home care. I had arranged for the social worker to arrive after Kate so that we could make it appear to be a chance encounter. This worked beautifully. I saw her when I got up to get a cup of coffee and brought her back to the table where Kate was seated. I had left the seat across from Kate open for the social worker. I introduced Kate to her and told her that she and Marilyn had something in common. Then Marilyn explained that she had been the social worker at the primary care practice where Kate goes and where Kate’s mother and my parents had gone. That led into a very natural conversation. Marsha was with us about 30 minutes before leaving. The agency that will provide the care requires an interview the person who will receive care before they assign a caregiver. At first, I had wondered how to explain this to Kate without saying that I was getting ready to bring in someone to care for her. Then I thought it would be natural for us to have this kind of meeting at Panera. It was like so many others we have there. It turned out to be a good idea. The next step, of course, is to explain the presence of a caregiver. I have been struggling with this, but Kate has been increasingly accepting of whatever I do. I think that I may be able to tell her truthfully that I don’t like to leave her alone and thought that she might like to have someone with her who could be a companion and also help her with anything she needs. I may mention some help organizing clothes. It would be wonderful if she and Kate could work together to sort through the things that she is not likely to wear any more and organize her closet with just those things that she will wear. We are scheduled to have the first visit on September 6 after Labor Day. That gives me time to talk with the social worker again and to think through the best way to make this transition. Although I am concentrating on making this go well for Kate, I am also mindful of the transition for me. This is a big step symbolically. In addition, I have enjoyed and become adjusted to being her sole caregiver. That will be hard to sacrifice, especially since I am not doing this to relieve the stress of caregiving. It is more an effort to make me feel comfortable when I need to be away from the house. For example, this will enable me to continue going to the Y, to Rotary, the grocery etc. I am confident that she and I will adjust. It is just a big step. In my recent entries I have paid particular attention to ways in which Kate has declined. One thing that I haven’t mentioned directly is that she has been unusually cooperative with me over the past few days. It isn’t that she is normally uncooperative, but she has held on to her independence and has expressed resistance to many things that I have done to help her. That involves things like offering her my hand when she is walking up or down steps, selecting clothes for her, or telling her about stains on here clothes. It also involves things like letting her know when it is time to go some place or how much time we have until we leave or whether we have a lot of time or whether we need to hurry. Recently, she has not expressed the same degree of resistance or irritation. I don’t mean that it has disappeared, but that it is very noticeable that she has been much more agreeable in the past few days. I can’t help wondering if this might not be another indicator of her decline, that she is acknowledging her dependence on me and letting me take charge. I will also say that I have been increasingly respectful of her desire for independence and wonder if my own actions have been less threatening to her sense of independence.